Yes, they are mentioned in every travel guide. Yes, they're teeming with tourists. But not all "tourist traps" are created equal. Here are 10 places our audience couldn't resist. And neither should you. Built between the 5th century B.C. 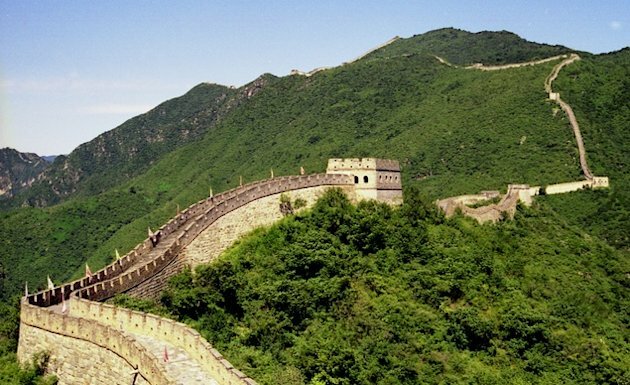 and the 16th century A.D. to block outsiders, the 5,000-mile Great Wallhas ironically become the very thing most visitors come to China to see. From Beijing, skip the most popular section, Badaling, which can be an exercise in dodging crowds. Instead travel an extra 30 minutes to the well-preserved segment in the model village of Mutianyu, itself worth exploring. Make the 90-minute journey by taxiâ€”independent cabbie John Ping charges $112 round trip. Book him a week in advance and factor in a customary 10 percent tip (beijingcardriver.com). Why it's a must: It's an astonishing testament to human ambition, ingenuity, and xenophobia, not to mention the fact that its size is astoundingâ€”it drapes the mountains in sections for 1,500 miles, from the Yellow Sea to its curiously abrupt conclusion in the middle of the far-west Gobi Desert. Believe it or not, the Eiffel Tower wasn't appreciated when it was built as the entrance to the International Exposition of 1889. A "barbarous mass overwhelming and humiliating all our monuments," and "a truly tragic street lamp" are just two of the protests published before it was built. Gustave Eiffel's contract called for the tower to be dismantled in 1909, butâ€”luckily for the rest of the worldâ€”by then it was being used as an important communications tower and was allowed to stay. Today, it's the most visited monument on the planet. Skipping the elevator and taking the stairs to the first or second floor (1er or 2Ã¨me Ã©tage) can easily save you an hour or more in wait time and leave you with a few extra euros in your pocket. Why it's a must: Yes, Paris' appeal goes well beyond classic images, but there's also something to be said for paying your respects to the most visited landmark on the planetâ€”and the quintessential symbol of Paris. The ornate bell tower's dramatic flaw made it an engineering calamity, then a curiosity, and ultimately, an icon. The tower started leaning shortly after construction began in 1173, and the tilt got worse as work on the building continued over two centuries, with several delays and attempts to correct the problem. Blame the marshy soil of coastal Tuscany. 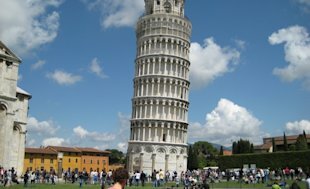 An 11-year, $27 million restoration that removed soil beneath one side and shifted the top of the tower closer to vertical by 16 inches, or half a degree, was completed in 2001 (but don't worry, it's still leaning to one side). Most people make Pisa a day trip from Florence; it's an hour-long $10 train ride away. Why it's a must: Because there is nothing else like it in the world. Go in knowing that you're there for the obligatory picture of you pushing or leaning on the tower. 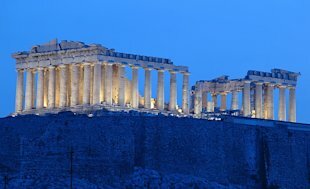 Towering above Athens you'll find the architectural pinnacle of one of history's most advanced civilizations. The 2,500-year-old complex includes the Parthenon temple and Erectheion, the tomb of the mythical Athenian king, Erectheus. Come early in the morningâ€”not only will you beat the crowds and the heat, but you'll get to watch the sunrise rise against the ancient pillars. Just down the hill from the Acropolis sits architect Bernard Tschumi's modern three-decades-in-the-making addition to the ancient site. The exterior of the glass-walled space, which holds 40,000 artifacts, reflects the Parthenon. One of the coolest features is the glass floor built over an excavation area dating back to 500 B.C. Why it's a must: Yes, you've seen countless images of the acropolis, but no photo can prepare you for the feeling you'll get when you're standing before this massive, ancient structure. The mysteries surrounding the ancient Maya seem only to heighten their appeal. Yet, there is one fact about this Mesoamerican civilization that we can all agree onâ€”the architecture they left behind is some of the most elaborate of all of the Mesoamerican civilizations. The massive Maya site of Chichen Itza is a prime example of their structural prowess. 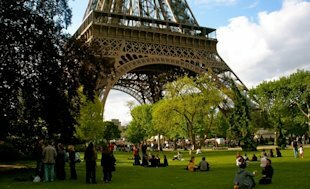 The site was recently named one of the Seven Modern Wonders of the World. One of the most visited archeological sites in Mexico, visitors come from far and wide to see ruins such as the sacrificial altar, the stone temple of the warriors, the ball court with its incredible acoustics, and, of course, the pyramid itself. 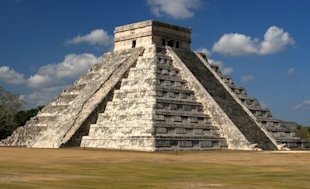 Chichen Itza can be reached by car or organized bus tours (typically about $35 per person) from nearby tourist hubs like Cancun or Cozumel. Why it's a must: There's no better way to understand the scale and mystery of the ancient Maya. 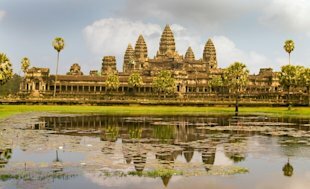 Just outside the city of Siem Reap, in northern Cambodia, lies a vast complex of ancient temples so breathtaking they've become a UNESCO World Heritage Site and a national symbol. In the 1960s, First Lady Jacqueline Kennedy ventured here despite the Vietnam War raging across the border just to see the site; more recently, portions of Angelina Jolie's first Tomb Raider movie was filmed in one of its tangled, tree-filled ruins. The main "city temple" is a 12th-century structure that began as an homage to the Hindu god Vishnu, then switched to a Buddhist sanctuary in the 16th century. An example of Cambodian Khmer architecture, the complex has three rectangular galleries, central towers, a moat, and elaborate bas-relief carvings illustrating scenes from Indian mythology. Why it's a must: When a country considers a place so iconic that they emblazon an image of it on their national flag, that's a sign that it's worth seeing. Join the visitors who flock here during sunrise and sunset for the best photos of the towers. Located in Australia's Red Centre, in the heart of the continent, this natural rock formation is one of the main attractions in the World Heritage Site Uluru-Kata Tjuta National Park. Uluru is a flat-topped sandstone rock standing about 1,100 feet high and almost six miles around, with a soulful, deep-red hue that changes throughout the day. 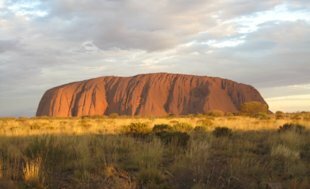 (The site is also known as Ayers Rock, so named by the colonial surveyor who "rediscovered" the place in 1873.) The site is sacred to the Anangu people of the Pitjantjatjara Aboriginal tribe, who believe the rocks were built during the ancient creation period and are still inhabited by ancestor spirits. Visitors can drive or join a bus tour to the park from Alice Springs (280 miles away), or fly to Ayers Rock Airport/Connellan (AYQ); Qantas and Virgin Australia offer direct flights from several major domestic cities. Why it's a must: It's the world's largest monolith and one of Australia's most famous natural landmarks. If that's not enough, Archeologist work suggests there were humans in this area over 20,000 years ago. The pharaohs built things to last. That's why the name of Cheops has survived for 4,500 years. After all, nothing says "Cheops was here" like a 450-foot-high pile of stones weighing 6 million tons and covering 13 acres. This Great Pyramid is the oldest, and last surviving, member of the Seven Wonders of the Ancient World. It bakes under the desert sun in the western suburbs of Cairo, surrounded by nine smaller siblings and the inscrutable gaze of the Sphinx. 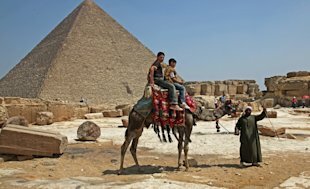 An old Arab proverb holds that "Man fears Time, but Time fears the Pyramids." Summer delivers 90-plus-degree temperatures and winter brings tourist throngs, but the shoulder seasons (March to May; September to November) promise fewer, and less-sweaty, crowds. Why it's a must: It's a scene that mankind has been marveling at for the past 5,000 years. Whether you're a first-time visitor or a regular, Barcelona has a way of seducing all who pass through. 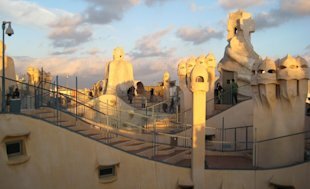 You have the daring design of Antoni GaudÃ­, whose gorgeously macabre Gothic cathedral, La Sagrada Familia, is the city's most famous tourist site. You have loud and lively tapas bars, which range from rustic spots with sawdusty floors to clean-lined spaces starring globally trained chefsâ€”the very embodiment of the mashed-up nature of Barcelona's culture. And then you have the beaches, where you can sunbathe, people watch, and swim to your heart's content. It's all so intoxicating, you'll find yourself thinking one thing: What should I try next? Why it's a must: Culture, cuisine, and coastlineâ€”what more do you want in a vacation? Venice teeters on the edge of clichÃ© with its lacework of canals, its domes and gilded spires, its kiosks with straw gondolier hats and refrigerator magnets in the shape of the Piazza San Marco. Postcard fodder, and yet ... Venice is beautiful. It has been so for centuries. To be a tourist in Venice is to join a procession reaching back to the 14th century, when pilgrims stopped en route to the Holy Land. To capitalize on its geography as the departure point for voyages to the East, the canny Venetians created festivals to coincide with the influx, a hint of the commercialism to come. 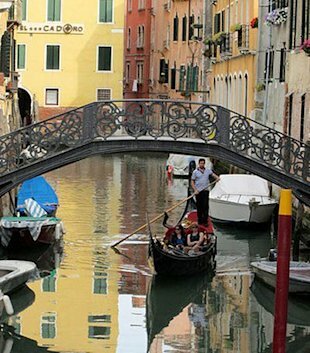 Irritating, that wallet-squeeze, but one you inevitably force yourself to stomach, particularly when catching sight of the Venice silhouette for the first time from the mainland shore of the lagoon. Yes, you have to take a boat or walk to get anywhere and then there are infinite detours, but that is all part of the charm. Embrace it, and make sure you see the city as it was intended to be experiencedâ€”on foot and by boat. Why it's a must: It's one of the most unique cities in the world, not only for its breathtaking architecture, but for its frailty. Visit now, while you still have the opportunity.